Home > Eye Wear > Glasses or Contacts? Whether you choose to wear glasses or contacts it is entirely up to personal preference, but your optician will be able to advise you about what is best for you and your lifestyle. Glasses and contact lenses can only be purchased with a valid prescription, which you will receive after an eye test. If you need to wear glasses or contact lenses a prescription will be given to you and it is valid for 2 years. You can take your prescription to any optician in the UK. There is a huge range of frames available so it may seem like a daunting task to find a pair to suit you. Whichever optical practice you visit to buy your frames staff will be on hand to advise you. Lightweight metal frames with just a hint of colour are best for people with fair skin. Tortoise shell frames often look good on those with pale complexions. Blue or green coloured frames should be avoided as they can make you look even paler. For dark complexions, silver, gold or clear frames look good. Although black may look too heavy, frames in burgundy and brown tones will suit darker complexions. The easiest way to remember what style will suit your face shape is that the frames should compliment not match the shape of your face. So totally round glasses will not suit someone with a round face. 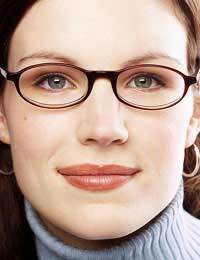 People with oval faces are lucky as almost all frames will suit them. Slightly elongated and square frames are best for people with a round shaped face, as they will help to highlight the upper face. So-called heart shaped faces suit more delicate glasses or rounded or square frames. Oval styles will be best for people with a square, angular face and long faces with high cheekbones look best with rounded glasses or frames with a strong top line. Many people prefer to wear contact lenses, particularly for socialising or playing some sports. In the UK there are more than 3 million people who wear contact lenses. They are often more convenient to wear than glasses as they do not get splashed by the rain or get fogged up in bad weather. They are particularly beneficial for those who need a stronger prescription and thicker glasses. Some people find they can see better when wearing contact lenses rather than glasses. Contact lenses are worn on the surface of the eye so there’s nothing to obstruct your peripheral vision as glasses might do. With lenses you can always see through the centre of your vision - the best part of your vision, as they move when your eye moves. Almost anyone can wear contact lenses, although special care is needed for older people and children. Your optician will be able to show you how to correctly insert the lenses. Common eye problems such as short-sightedness and long-sightedness can be corrected with contact lenses. If you have astigmatism or presbyopia there are also contact lenses available which can correct or manage these conditions. There are also tinted contact lenses which can enhance or change the colour of your eye. Can I ‘lose’ a contact lens in my eye? It’s not possible for lenses to slip around to the back of the eye. There is a thin, transparent membrane which covers the inside of the eyelids and the outside of the eye which forms a seal preventing a lens moving to the back. This membrane also stops any grit or dust getting behind the eye. Sometimes a lens may ‘hide’ behind the eyelid but your optician can easily rectify this. Generally it is not advisable to sleep in contact lenses. If you wear soft lenses, with a low or medium water content, it is very dangerous to sleep in them as it may cause infection or even damage the cornea. If you wear hard lenses, your optician may advise you when you can wear them overnight.